I'm actually a bit fed up with making chocolate cakes and would have preferred to make something else, however when asked what kind of cake he would like for his birthday, my husband replied "chocolate cake" and would take no dissuading. I decided to make Angela Nilsen's The Ultimate Chocolate Cake a recipe that I have looked at before on the BBC Good Food website. It's a mega recipe containing 200g of dark chocolate, tons of butter and sugar. It's also topped off with chocolate ganache involving another 200g of dark chocolate and 285ml of double cream! I decorated it with some little golden stars and created an 'Olympic Torch' effect with the candles. Here are the candles when the 'torch' had been lit, you can also see some little buns piped with buttercream which were for anyone who didn't want chocolate cake. Who am I kidding, I could have saved myself a lot of work, as even my little grandson scoffed down the chocolate cake. I'm entering The Ultimate Chocolate Cake for Bookmarked Recipes hosted by Jacqueline from Tinned Tomatoes from an idea by Ruth from Ruth's Kitchen Experiments founder of the challenge. Looks gorgeous - really rich and decadent and I like what you did with the candles! Happy Birthday to your hubbie. I love deeply chocolate cakes, the coffee just seems to intensify the chocolate flavour - I'd just love a slice with a big mug of coffee. The cake looks Devine! I expect it is rich and unctious especially with the ganache - and that olympic flame effect is inspired! Drool!! Oh my God, that looks amazing!! looks gorgeous! how come your ganache is sooooo smooth! 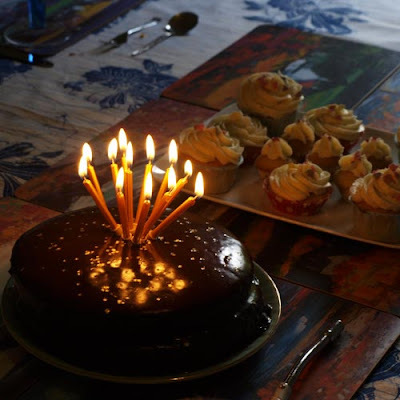 Happy Birthday to Hubs and what a LOVELY cake too Janice! PS - SUPER ganache darlink! Thanks for lovely comments about the ganache, I didn't even do it like it said in recipe. Just bunged everything in the bowl over pan of water and melted. Thought it was a bit on the wet side but it certanly did have a nice shine. Just wait till I've been on my chocolate tempering course at end of August! Now THAT is what I call a chocolate cake. Janice, it's got to be the best one I've seen in a long time. 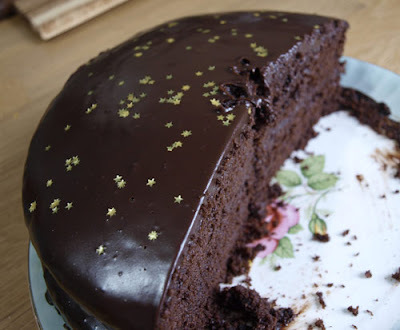 A nice moist rich cake and a brilliantly shiny ganache too. Happy Birthday to Mr FG. I'm feeling quite envious of your chocolate tempering course and really really must get one sorted out soon. Oh my, that is some compliment from The Queen of chocolate herself! Thanks Choclette. Well, I can understand wanting chocolate cake when you're celebrating a birthday. And this is a serious chocolate cake. Love your idea with the candles. Goodness me! This look so moist and gorgeous. 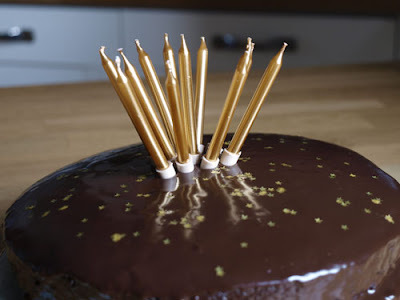 Your ganache has come out so shiny and I love the Olympic torch idea. I would eat this cake every year for my birthday if I could. Nothing like a decadent chocolate cake to make me happy. This is divine! I'd love someone to make me a cake like that for my birthday its looks sooooo good. Looks so glossy and lush. The ganache is so shiny it could be a mirror - how great is that. Reckon a chocolate mirror would always show my best side lol. This is an epic chocolate cake no doubt about it. Your husband is one lucky man. I keep looking at that recipe on the BBC Good Food website and wondering what it's like. It certainly seems to have rave reviews and yours looks deliciously chocolatey and moist. I do like a good chocolate cake, but sometimes, like you, I prefer something different. I might have to try this one now though! The inside of the cake looks incredibly moist, looks like you were on to a winner. No matter how much I think I don't want chocolate cake, I can never resist more once I've had a piece! Pass the cake now!! This looks like the cake of my dreams :) Love the candles too - genius!